Public Health: What’s Digital Got To Do With It? I recently wrote about the heroic efforts of volunteer pilots involved in Mercy Medical Airlift and Air Compassion for Veterans. 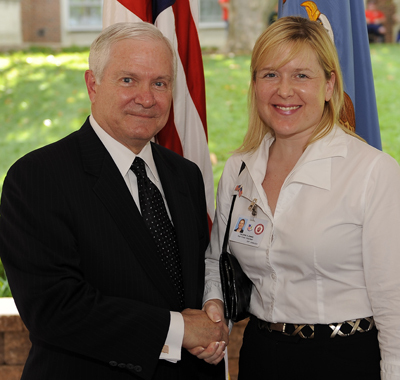 I met Steve Craven on a shuttle to a Red Cross event with US Defense Secretary Robert Gates. Steve kindly explained a little bit about what some airlines are doing to contribute to our active duty and veterans’ medical transportation needs. I was soon contacted by American Airlines to help them with awareness efforts of their own veterans initiatives. I interviewed Captain Steve Blankenship, the Managing Director of Veterans Initiatives at American Airlines. Feel free to listen to the podcast or read a summary of our discussion below. Dr. Val: Tell me a little bit about yourself, Captain. Blankenship: Being a veteran myself (20 years with the US Cost Guard) a count it a real privilege to serve our veterans. During my first 8 years with the Coast Guard I was a helicopter rescue crewman doing search and rescue based out of Miami, Florida. I eventually went to navy flight training and retired from the military in 1991 and was hired to fly for American Airlines for the next 14 years. In 2004 I helped to launch their Veterans Initiative. Dr. Val: Tell me about Operation Iraqi Children and Snowball Express. Blankenship: There are so many children who have never been in uniform, but who have paid the ultimate price of losing a mom or a dad in war as they defend our freedoms. American Airlines is particularly proud to be supporting childrens’ initiatives. The Snowball Express program involves private flights around the country to pick up kids and their surviving parent to take them on a fun-filled trip during the difficult winter holiday season. Actor Gary Sinise helped to co-found Operation Iraqi Children where we shipped over 25 tons of toys and educational materials to Iraq. Our troops were able to give out 10,000 individually wrapped gifts to young children in Iraq. Dr. Val: What about American Airlines’ support of the iBot Mobility System for wounded veterans? Blankenship: The iBot is a special kind of wheelchair (designed by the guy who created the Segway) that allows its user to sit at an eye level with someone standing next to them. They can also climb stairs. To date we’ve raised over $700,000 to buy these iBot Mobility devices for our wounded warriors. Dr. Val: What else is American Airlines doing for veterans? Blankenship: We fly wounded warriors and their families on charter flights from Brooks Army base to Disney World. We have three dedicated “yellow ribbon” airplanes that we use to fly recovering service men and women to events so they can get out of their rehab centers for a period of time and have fun with their families. This kind of charity comes naturally to us because American Airlines was founded by a military veteran and over 10% of our current staff are either active duty military personnel or veterans. Every day we go to work, we recognize that the right and privilege we have to fly our airplanes and transport our passengers was paid for by the men and women who wear the cloth of our nation. American Airlines is continually looking for ways to thank them and support the efforts of our military. Dr. Val: How do military and their families find out more about your programs and services? Blankenship: They can send me an email directly and I’ll make sure they’re referred to the right place. Have you been following these bloggers? Well you’re in for a treat. I had the good fortune of coralling them for a healthcare reform discussion, lead by Dr. Bob Goldberg of CMPI-Advance. Bob’s recent Op-Ed at ABC can be viewed here. I was going to provide a synopsis of what they said, but then – that would spoil the show! The recent peanut butter/salmonella outbreak offers another opportunity to reflect on the underlying budget crisis and staff shortage at the Food and Drug Administration. I interviewed Tommy Thompson, former Secretary of Health and Human Services, about what the peanut butter debacle tells us about the FDA inspections of our food supply. You may listen to our conversation by clicking on the play button, or read a summary below. Enjoy! Dr. Val: Has this recent outbreak influenced how the FDA tracks food ingredients? Thompson: No it hasn’t. We have a serious food problem in America because the FDA is understaffed. There have been too many outbreaks of food poisoning – everything from listeria on cucumbers and onions to salmonella infections from ice cream and peanut butter. Approximately 82 million people experience an episode of food poisoning each year, 350,000 of them require treatment in a hospital and 8,000 die. People don’t seem to realize what a large problem food poisoning is until there is a new outbreak. The recent peanut butter contamination affected between 700-800 different food products. Americans need to realize that the FDA is severely understaffed and cannot do the inspections necessary to protect all of our food. I’ve been harping about this for a long time. When I was Secretary of HHS I was able to increase the number of inspectors by 100%, but since I left the funding was decreased and the numbers of inspectors is back to the level when I started. There are 64,000 venues that the FDA has to inspect, and there are only 700 inspectors. It is geographically and mathematically impossible to do all the inspections. The FDA is responsible for inspecting 80% of our food supply while the department of agriculture does the rest. The department of agriculture has 7000 employees and 6000 venues that they have to inspect. Just compare the resource differential between the FDA and the department of agriculture and you see the serious constraints under which the FDA operates. The department of agriculture inspects every meat processing factory every day. But an FDA inspector may get to a food processing plant only once every 6 or 7 years. Dr. Val: Wow, that’s enlightening and also terrifying at the same time. Thompson: Yes, it really is. We inspect less than 1% of the food coming into America. The amount of imported food continues to increase as the number of inspectors decreases. We have some serious problems with our food supply and it’s about time that congress recognized this. The FDA is doing the best job they can, and yet they are regularly criticized by the media. When you consider their limitations, they’re doing a heck of a good job with the resources they have. Dr. Val: So what do we need to do to improve this situation? Thompson: The FDA needs a larger budget, we need to get more inspectors out there, we need updated testing technology, but we also need a more modern law that would require food processing plants to file an affidavit with the FDA to ensure that their food is safe. There’s very little supervision of these companies. Dr. Val: Is there anything the public can do to petition the government to increase funding to the FDA so they can inspect our food properly? Thompson: There’s a coalition to improve the quality of food inspections at FDA and I’m a part of that. There are people in congress who are working on introducing legislation to provide the FDA the resources necessary to hire more inspectors, and to require affidavits of safety from food processing plants. Dr. Val: Do you think Dr. Joshua Sharfstein will become the new FDA commissioner? Thompson: Sharfstein is being considered for a position at FDA, whether it’s commissioner, assistant commissioner, or chief of staff I don’t know. Dr. Val: Do you have any advice for the new FDA commissioner, whoever it is? Thompson: Yes. In addition to lobbying for increased funding to support more inspector positions, he or she should consider appointing a special commissioner of food that would report directly to the Secretary of Health and Human Services. The new FDA commissioner should focus on getting medicines and new drugs to market. In 2008 we had fewer new drugs get to market than any year since 1981. The entire FDA is overworked, the responsibilities are great, and congress meddles too much in their affairs, though that may change now that the democrats control both houses and the presidency. The staff at FDA are becoming demoralized because every time they make a decision someone in congress criticizes them for it. Then they become reluctant to make decisions at all. Many Americans have been surprised and disappointed by Senator Tom Daschle’s withdrawal as HSS Secretary nominee. I asked Tommy Thompson, former Governor of Wisconsin and the 7th U.S. Secretary of Health and Human Services, what he made of this. You may listen to our full conversation by clicking on the podcast arrow, or read a shortened summary below. Enjoy. Dr. Val: Tom Daschle’s withdrawal as HHS Secretary nominee has been a real shock for most people. Some are saying that without Daschle’s influence, healthcare reform will take a back seat to other economic priorities this year. What do you think? Thompson: I don’t think that will happen because we’re in such dire need of reform that even without Tom Daschle there’s going to be a tremendous transformation of the healthcare system this year. Two healthcare bills are already undergoing the legislative process, and one is ready to be signed into law – the expansion of SCHIP, the insurance plan to cover poor children. The second bill involves the expansion of COBRA, which allows unemployed individuals to buy in to their previous employer’s health insurance plan. But beyond this, the new stimulus package has 20 billion dollars set aside for health IT infrastructure – to create an electronic medical record for all Americans and beef up broadband access. There will also be a lot of money set aside for preventive health initiatives – to help Americans become healthier so they won’t need as many medical services. Of course, Senator Kennedy is pushing for a “play or pay” plan modeled after Massachusetts’ law. There will be a lot of pressure to get this done quickly due to his ailing health. So you can bet your bottom dollar that the healthcare system that we know today is going to be changed so considerably that I doubt if you’ll recognize it a year from now. Dr. Val: Do you have any idea who might replace Tom Daschle as HHS Secretary nominee? Thompson: I’ve been hearing a lot of names. Governor Kathleen Sebelius from Kansas is very much in the running. Howard Dean’s name has also come up. Overall I do think it will be a governor or former governor who gets the position. Dr. Val: What sort of person would have the skills for the job? Thompson: I think a governor is the ideal person for the job because they already have experience running both state and federal programs – both initiating and managing them. Dr. Val: Do you think that being a physician could be an advantage as well? Thompson: There are so many physicians in the department that I don’t believe that being a physician adds or detracts from the position. Being the Secretary of HHS is an administrative position and although doctors have many skills, I’m not sure that running a large agency of over 67,000 employees with a budget of over 600 billion dollars is something that most doctors have the experience to do well. Dr. Val: Do you think Daschle made the right choice to withdraw? Thompson: Tom Daschle is a friend of mine. I think he’s an honorable person and I think he would have made an outstanding Secretary of HHS. I’m sorry he’s withdrawn, but the debate about his taxes was splashy enough to be affecting the stimulus bill and diverting attention from it. So I think overall it was probably the right thing to do. Dr. Val: What’s the most important thing for the American people to know about the Daschle case? Thompson: They should know that there is no double standard between people in power and those not in power. All of us are equal in the eyes of the law, and we’re a country of laws, not of men. We’re all responsible for our own personal decisions, and that includes paying our taxes. See KevinMD’s excellent round up of further thoughts about Tom Daschle.